Air set moulding was developed as a production process to help compensate for the ever-increasing demands of the casting buyer. Air set sand moulding produces a sand mould of considerable strength, which can be free standing without the need for moulding boxes and therefore unlimited in size. The process requires graded kiln dried sand, which is mechanically mixed with a resin to bind the sand together. A chemical hardener is then added to the sand mix, which reacts with the binder and begins to set the sand into a solid form. At this point the fluid sand is rammed around a pattern or multiple patterns. Once rammed the sand is left to set. Setting time being dependent on the type of hardener used, be it a 3-minute hardener or a 30-minute hardener. The sand literally sets into a solid block from which the pattern equipment is drawn. Cores are then added to the mould and the mould closed ready for casting. Air set moulds allow for much larger, intricate castings to be produced. A solid sand structure allows the mould to be literally built from its individual pieces. Castings of complexity can be produced which may otherwise have to be fabricated from individual parts. An air set mould is best suited to larger heavier castings as the mould strength allows for greater weight of metal to be cast, sand use can be kept to a minimum without compromising quality so production costs are reduced. Gravity die casting is a manufacturing process for producing accurately dimensioned, sharply defined, smooth or textured-surface metal parts. It is accomplished by gently pouring molten metal into re usable metal dies under the force of gravity. The term "die casting" is also used to describe the finished part. 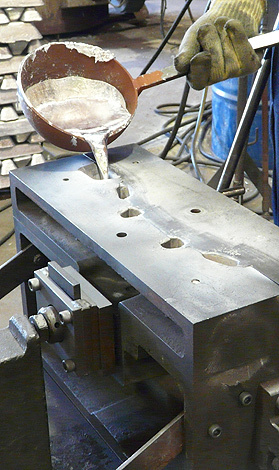 To begin the process a cast iron mould capable of producing tens of thousands of castings must be made in at least two sections to permit removal of castings. These sections are mounted securely to a solid base and are arranged so that one is stationary (fixed die half) while the other is moveable (ejector die half). To begin the casting cycle, the die caster clamps the two die halves tightly together. Molten metal is poured into the die cavity where it solidifies quickly. The die halves are drawn apart and the casting is ejected. Die casting dies can be simple or complex, having moveable slides, cores, or other sections depending on the complexity of the casting. 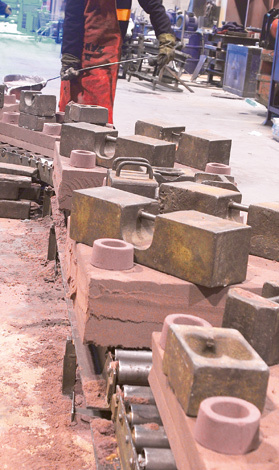 The main advantage of gravity die casting over sand casting is the high speed of production. The reusable die tooling allows for many hundreds of castings to be produced in a day. High definition parts reduce machining costs and superior surface finish reduces finishing costs. Although die-castings are in most cases cheaper than sand castings, die tooling is considerably more expensive than sand tooling so an optimum number of castings need to be produced to make the process cost effective in the long run. The green sand moulding process requires sand, clay and water to be mixed together to form a mould material that can be compacted around a pattern to produce a mould. Water develops the bonding characteristics of the clay, which binds the sand together, when used in its moist condition it is referred to as green. When rammed and compacted around a pattern a mould of sufficient strength is produced to allow metal to be poured into it to produce a casting. The green sand process can be used to produce castings in both aluminium and copper based metals. The process allows 90% to 95% reclamation of material and so provides a low cost form of production. Because we still use individual bench moulders rather than the more mechanised moulding machine we can be totally flexible in our approach to mould production. Patterns can be loose, board mounted, individual or multiple.